Filling out the FAFSA form can be a straightforward and easy process. The fafsa.gov site will guide you through the application; select the "START HERE" button on the home page, and just follow the directions on the screen. The first thing they will have you do is to create your FSA ID. 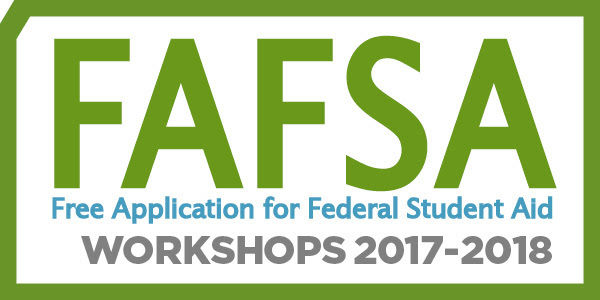 New to Federal Student Aid? Create an FSA ID account here. An FSA ID gives you access to Federal Student Aid’s online systems and can serve as your legal signature. Only create an FSA ID using your own personal information and for your own exclusive use. You are not authorized to create an FSA ID on behalf of someone else, including a family member. Arizona's College Goal FAF$A is a statewide initiative that provides free information and professional assistance to Arizona students and families seeking college financial aid. The Arizona Commission for Postsecondary Education has planned and coordinated the Initiative since 1996. The mission of College Goal FAF$A is to increase the number of first-generation and under-served high school seniors and adults entering postsecondary education. to provide accurate and timely communication regarding student financial aid. year-round distribution of student financial aid information via this website. TUESDAY, DECEMBER 13 // 2 - 4 P.M.
WEDNESDAY, DECEMBER 14 // 4 - 6 P.M.
TUESDAY, JANUARY 10, 2017 // 2 - 4 P.M.
TUESDAY, FEBRUARY 14, 2017 // 2 - 4 P.M.
WEDNESDAY, FEBRUARY 15, 2017 // 4 - 6 P.M.
TUESDAY, MARCH 14, 2017 // 2 - 4 P.M.
TUESDAY, APRIL 11, 2017 // 2 - 4 P.M.
WEDNESDAY, APRIL 12, 2017 // 4 - 6 P.M.
TUESDAY, MAY 9, 2017 // 2 - 4 P.M.
WEDNESDAY, MAY 10, 2017 // 4 - 6 P.M.
3. Information about Assets, such as Savings, certificates of deposit, stock options, bonds, 529 plans and other college savings programs; and investment real estate, business and farm. 5. Dates of Birth, include month date and year. To get the most out of this workshop, start by completing this worksheet.